A contempory watercolour painting by Melbourne artist, Jason Roberts. Imagine the value to Melburnians and visitors alike of having a central station where the passenger services are highly efficient, readily accessible and where the station precinct provides a range of ancillary services. The future demands on the public transport system need to be the prime consideration in the design of the platforms and tracks to cater for a rapidly expanding use of the system. Additional tracks and thoroughfares for the new cross city freight facilities need to be incorporated. 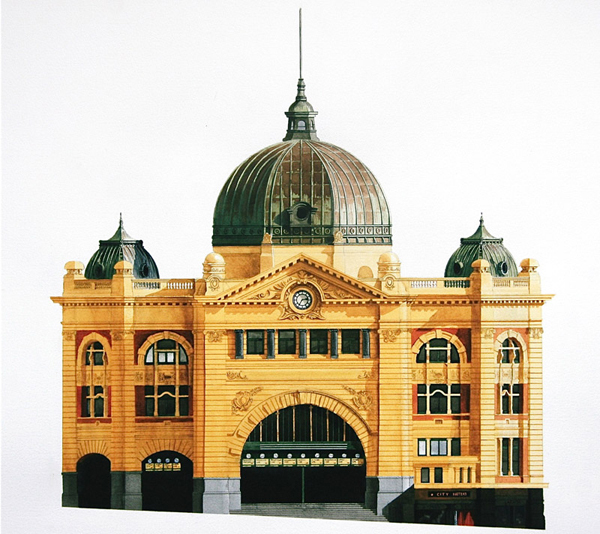 The provision of viable and highly efficient public transport facilities for the future is the prime consideration in the current Flinders Street Station Design Competition. Imagine to the refurbishment of the heritage listed building and the return of public facilities such as a ballroom, gymnasium and library. Imagine that the building is tenanted with a diversity of interesting browsing shops from coin collectors, hand crafted goods, and eclectic book sellers to hobbyists. Imagine that the building could also provide space for regional interest groups such as historical societies and art and craft associations to stage exhibitions which would be so accessible to the general public. The 2nd Floor area under the Ballroom would be a viable site. Imagine that a large section of the precinct such as the Milk Dock was refurbished in order to house ‘the story of the suburban rail network in Melbourne’ and included a collection of refurbished trains from the first Taits. All of this is possible. Make sure your voice is heard!